An artist’s rendering of the entrance to the new nursing home. What happens to a dream deferred? In the case of Tinton Falls developer David Portman, the long wait is over for his dream to come true. 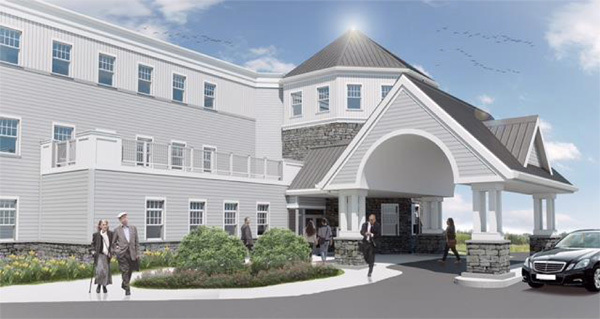 After languishing for more than 30 years, his vision for a kosher, not-for-profit Jewish rehab and skilled nursing home in central New Jersey is being realized in Freehold. The project never got off the ground, Portman said, because Asbury Park’s government officials and merchants still had hopes of bringing the Berkeley back as a stopping place for tourists and vacationers. There were later attempts, too, but all fizzled until 2013, when site approvals began in Freehold. Portman, president of Triad Group, along with two partners, is responsible for the adjacent Pond View Professional Park, a four-building medical/professional office complex. 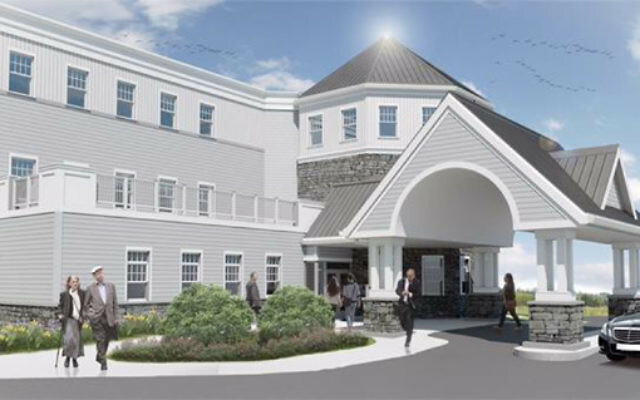 He said the new facility, to be known as The Jewish Home for Rehabilitation & Nursing, will have 150 beds — 60 for rehab residents, 60 for those needing subacute, post-hospital care, and 30 in a secure memory unit. A marketing plan prepared by the home’s development team notes that eight counties in New Jersey rank among the highest in the nation in terms of Jewish population percentage. Three of these counties are an easy drive from Freehold — Monmouth, with an estimated 64,000 Jews; Ocean, with 61,500; and Middlesex, 52,000. The home will also have a large front room designated as a synagogue, and a chaplain will help deal with residents’ spiritual needs and lead daily services in the Orthodox tradition. There will even be an automatic elevator for the Shabbat-observant. Although Portman’s firm is involved in building and property management, and he is the lead donor for the $24 million project, the contractor is Barcon, Inc., of Freehold. BH Healthcare Management LLC, an affiliate of Caring Health Systems, Lakewood, will be handling the facility’s day-to-day operations, Portman said. Rabbi Ben Schachter, a BH managing member, expects a staff of approximately 150, including registered nurses, licensed practical nurses, certified nursing aides, social workers, dietitians, physical and psychological therapists, kitchen personnel, supervised by a mashgiach (all meat will be glatt kosher), and housekeeping and maintenance crews. “Some will be employees, others will be contracted outside vendors, and, of course, volunteers will be welcome,” he added. A medical director will establish and monitor policies and procedures and will work with visiting physicians and specialists. Nursing services to be provided include peritoneal dialysis, chest tube care, total parenteral nutrition, IV antibiotics, wound therapy, congestive heart failure monitoring, post-stroke care, accident trauma, orthopedics, pulmonary care, psychiatry, and geriatrics. Plans also call for an outdoor terrace, a memory garden, and other softening touches intended to make residents as comfortable as possible. The home, Portman said, is in an ideal spot. It is centrally located — just one mile from CentraState Medical Center, a leading area hospital, and close to Route 9, an artery that runs all the way from below Lakewood in Ocean County to well above Woodbridge in northern Middlesex County. He added that there are also five major hospitals within 16 miles, and Robert Wood Johnson University Hospital in New Brunswick is less than 50 minutes away by car. Work on the 12.2-acre property — located at 1151 West Main St. (Route 537), near the corner of Gravel Hill Road — has been under way since June 20, and the frame for the three-story, 87,000-square-foot structure is nearing completion. Portman said the official ground breaking will likely take place in the coming months.